For the sixth year in a row, the Sunrise Tennis Club will be the setting for the BMW Tennis Championship, an ATP challenger tour event. The competition will run from March 15 thru 22. Some of the world’s best players will be on hand displaying their skills on the hardcourt. The 32 men singles field will consist of 22 direct acceptances, 4 wildcard spots, yet to be determined, and 6 disputed qualifying slots. Spaniard Feliciano Lopez ranked 34th , who aided his country this past year to a Davis Cup title, will be in attendance as well as 2008 Wimbledon quarterfinalist and world number 30, Germany’s Rainer Schuettler. Israeli Dudi Sela, who was instrumental last week in helping his nation advance to the quarterfinals in Davis Cup by defeating Sweden, will also appear. Other recognizable names scheduled to take the court include Jeremy Chardy and Marc Gicquel of France, Russian Mikhail Youzhny, Italian Simone Bolelli, Serb JankoTipsarevic and American Bobby Reynolds. Moreover, 16 doubles team will be vying to claim the tournament’s top prize. The BMW Tennis Championship boasts a distinguished list of former winners: Frenchman Gael Monfils in 2007 and Russian Dmitry Tursunov in 2006 to signal a couple. 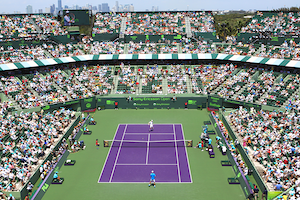 For the first year, MiamiTennisBlog.com will be on the grounds bringing you live coverage. The time is now. For more information on the participants, the event and to buy tickets, go to bmwtennischampionship.com , call 877-877-7677 or show up at the Sunrise Tennis Club. Get your tennis on by supporting your local tournament.